I am an iceclimber. Or more just climber. I climb everything. Buildings and industrial structures for work, bouldering for strength and social fun, routes because I love that, Alpine because I sometimes like to suffer and mixed because I love the technical awkward leverages you do with those sharp tool thingies. Oh, yes and I happen to climb comps too. Worldcups and stuff like that. Way too nervous to do anything good in there but still fun. For 1,5 months I've been living in Germany now. At the edge of the Alps in the region Allgäu. I'm originally Dutch. In the flat country where I was born we only have climbing gyms. No rocks, not even small ones, not even ones small enough to trip over. Really. The Netherlands is just all sand, mud and water. That makes it all pretty hard to train for iceclimbing. We only have horizontal ice. Probably the reason Dutch are rather good in speed skating. The chance to move to Germany was amazing! Dennis, my boyfriend, is writing his final paper for his studies in Industrial Design at a climbing gear company. That company is based in Southern Germany. Being without my boyfriend for longer then a month just doesn't work. I gave up all I had, even the fridge, couch, my house and my job. And moved in with Dennis. Luckily the gear company Dennis now works for was super sweet and offered me a job too! Yay! Wake up > eat a banana > run to work (8km) > shower > eat breakfast and work > go bouldering during lunch time > eat lunch when working > work till late and drive back with colleagues or with Dennis > eat some food > cycle to the climbinggym > climb till 10 > cycle back > sleep. But we also have weekends. That are days that we're not supposed to work. But the company I now work for has such a super nice atmosphere that we're even willing to climb with them in the weekends. Last weekend ánd this weekend we found ourselves on Saturday in Starzlachklamm, a dark, wet, sketchy cave that just calls for drytooling. Coffee, climbing and more. A perfect way to spent a weekend. On the Sundays we went sportsclimbing. Outdoors. So awkward that you can just go outdoors whenever you want. We don't have that back home. During the weekdays it was already dark when we got back home. It made no sense to climb outdoors then. 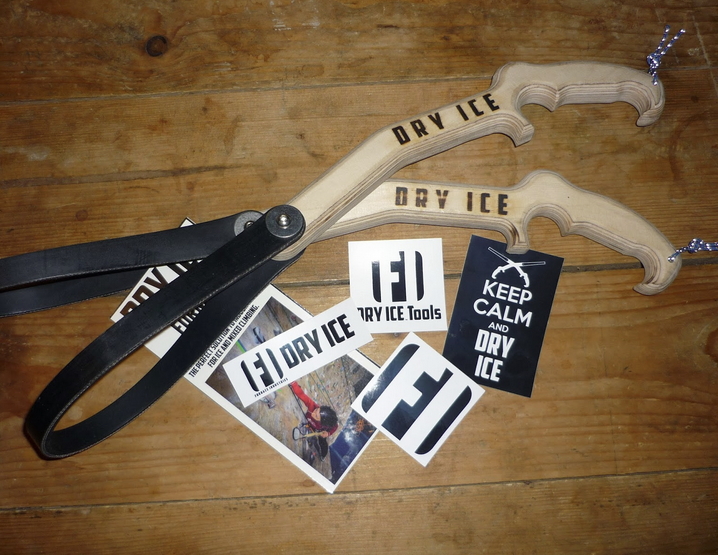 The good alternative for iceclimbing are the DryIce tools. And I'm one of the lucky ones that got a pair! I already used them a couple times in the Dutch gyms. There people looked at me like I was crazy and playing a dangerous game with those things. They gave the regular non-iceclimber comments: "oh, thats so easy, you're just holing on to this big grip all the time" or "now you've got so much more reach, that makes climbing just so easy now". Here in Germany the voices are surprisingly different! The first time when we pulled out the tools people stopped climbing to watch us. They wondered what this strange stuff was and understood immediately that we were serious about the Winter season. 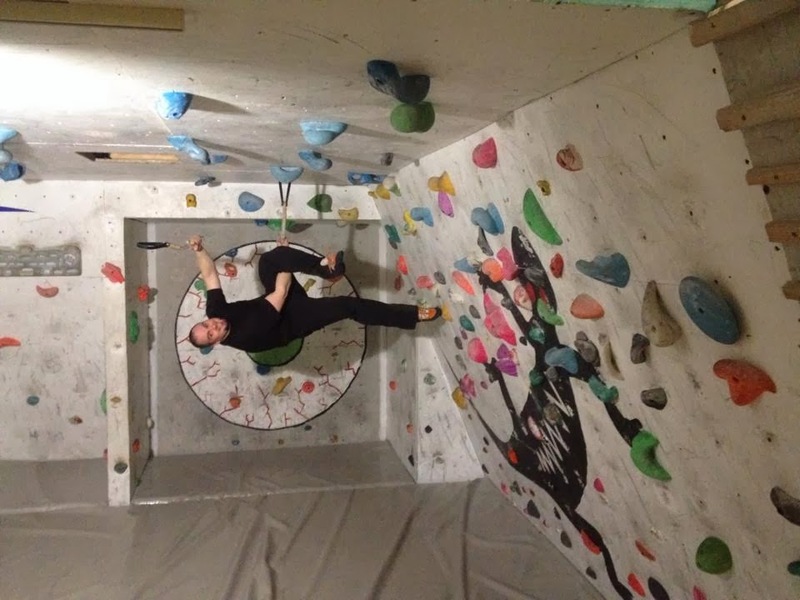 Within the time that I now live here two other climbers tried to make replica's and we're starting to have rather fun group tooling sessions in the boulder room (wow, that last bit of this sentence sounds weird when you're a non-climber). Dennis has a different brand for his "dryice tools". And we got yet another pair from a Scottish friend. We can clearly say the rubber sling on the DryIce tools gives by far a better grip on the holds compared to the other two brands that we've tried. Also the handles are shaped differently. More comfortable and more realistic, closer to the design of the iceclimbing tools that we use on the comps. It can still have a little tweaking though. We think the upper grip of the tools can be made a little more comfortable by lengthening the pink-rest on the upper grip. We easily make figure-of-fours and even long reachy swing moves with the tools. Our heavy 100+ kg friend Axel climbed with them as well and even he could easily swing around in the roof. Proving that the things are pretty strong. In the Netherlands all the gyms are just toprope, we'd still use leashes then. A tricky thing when leading with tools is that you can pop off when clipping. And then you're hanging in your spinner leash... So. When you clip: one tool in your thumb, of the hand that you hold on to the other tool (see picture). The other hand is then free to clip and when you now accidentally would fall you'd just hang in mid-air. So far the holds are not getting 'greasy'. I'm not using gloves and when my hands get sweaty I even chalk. In this way I grow thicker skin, which is useful for the long Winter routes. Negative thing of climbing with the tools is always that you can't really train precision as well as with real tools on real holds. You never have the same sketchy tricky moves on which you need 200% body tension. For that stuff we have to go outdoors and do the real stuff. Also speedclimbing, Dennis won a worldcup in that discipline last year, is hard to train with the tools. You're not as free as on real ice (of course) and are limited to the holds on the wall. Though, regular tools won't do any better on an indoor climbing wall. It's kind of funny how different it is to climb with tools. I can climb with my hands hard sports routes in the Summer, but then on the start of the Winter season I really need to build up a different kind of strength again. The muscles that I need for the iceclimbing are different from the ones I need for sportsclimbing (there is a big overlap though). Being able to climb more with something that simulates ice tools is for that reason super useful. Useful for any iceclimber. Now that I figured (of figure-of-foured) the pro's and con's of the tools it's time to head out again.